Vose Software was founded by David Vose and Timour Koupeev, two friends who had built their careers providing quantitative risk analysis consulting to governments and businesses in a wide range of fields. David and Timour found that the risk analysis software available at the time were very limited in the capabilities they provided, making it a struggle to build risk analysis models that were compact, easy to understand and a good reflection of the problems they were trying to describe. Vose Software was created to offer a much richer choice of risk modeling tools. 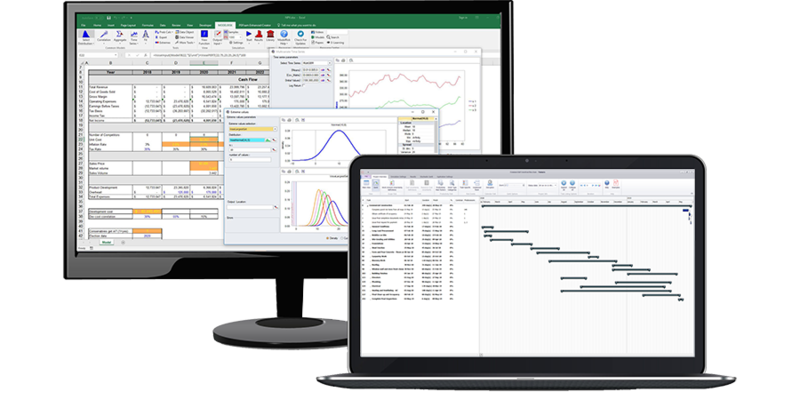 In 2008, the first version of ModelRisk (our Excel risk analysis add-in) was launched. It represented a quantum leap in risk modeling capabilities, introducing innovative new features like copulas, time series, aggregate functions, electronic results graphing and sharing with ResultsViewer, as well as greatly extending the range of probability distributions the modeler could choose from, and much more. The influence of ModelRisk on the market is obvious – every serious challenger to the risk analysis Excel add-in market attempts to include at least some of ModelRisk’s features, though with debatable success. Since 2008, we have continuously improved the capabilities of ModelRisk, releasing a major update at least once a year on average, and ModelRisk remains easily the most powerful tool in its field. In fact, no competing product has yet managed to offer the range of capabilities that ModelRisk offered back in 2008. In 2012, we were invited by BWise – a company that is now part of NASDAQ – to develop a tool that would allow their clients to perform operational risk analysis within their web-based GRC platform. Solving the technical challenges of creating these OpRisk capital allocation models led us to develop various techniques and software tools that now form the backbone of our StopRisk solution. In 2014, Edison Southern California approached us with a unique challenge. They wanted to be able to perform risk analysis on the decommissioning of one of the nuclear power plants. The problem was that this is the largest decommissioning ever undertaken, with a project plan containing well over 30,000 tasks, and no project risk analysis software on the market could cope with such complexity. In response, we developed Tamara – our project risk analysis software. Building a risk analysis simulation tool that could handle such immense projects meant we needed a simulation speed that was orders of magnitude faster than anything available, so we set about building a simulation engine from scratch, using every trick we could think of to optimise the speed. The challenges didn’t stop there, however. Risk and uncertainty can take many forms and have very different effects on a project plan, so we gathered together a panel of a dozen World experts on project risk and asked them to describe all the different ways risk can affect a project, then made sure that Tamara was able to describe those effects. Edison Southern California have been a fantastic partner in this project, using Tamara very extensively and offering criticism and suggestions until we were all completely satisfied. Tamara was released at the end of 2016 as a commercial product. Our long consultancy experience has shown us that a key concern that senior management have is knowing whether the spreadsheet-based risk analysis models built by their employees are realistic, error-free and use the latest data. It is often the case that several versions of the same model are floating about in a company with little or no control, and sudden changes in the forecasts that the managers are presented with cannot be properly explained. In 2016, we launched ModelRisk Cloud in response, combining some of the unique stochastic assumption-sharing and results sharing capabilities already developed for ModelRisk with a web-based storage and tracking system for ModelRisk models and their results. In 2017, we are releasing our most ambitious software development to date , called Pelican. Pelican is designed to help companies manage risk across their entire business.